Innocent was born three years after unrest started in northern Uganda and three years before the formation of the anti-government Lord’s Resistance Army led by Joseph Kony. Death came to his village when he was only seven, and soon his parents required him to sleep miles away from home for safety. At ten he was abducted by Kony’s army and taken to a training camp for child soldiers, where brutality and violence became his new reality. After a narrow escape he was taken by government soldiers to a counseling center before returning to his family, now without the guidance of a father. Since that time, Innocent has exhibited extraordinary resilience, pushing through these and many other challenges, ultimately securing a position which has allowed him to come to the aid of countless children in Uganda facing much of the same hardship. 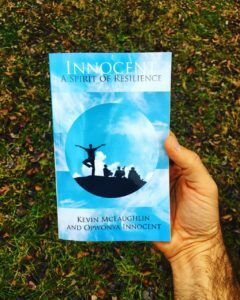 The book reveals, in his own words, Innocent’s struggle to heal from the trauma he experienced, a growing awareness of a desire to help others and his tireless effort to realize meaningful, positive change. Innocent’s inspiring story embodies the triumph of hope and determination over pain, trauma and fear. The book is also available through Apple iBooks and Google Play.